I begin to wonder when people will start hating me for going around and spreading my love for pearls. But, hey, they are asking for it! How many times did I go to a party and some unknown women were coming to me and asking about my jewellery while putting their fingers on my neck? It’s nice though. Oftentimes, it brings me pearl stories that would have remained untold otherwise. A good friend of mine grew in beautiful Turkey and spent most of his summer holidays at the Turkish Riviera. He has always been a good and passionate diver, so most of his time he would be spending in the water, gently making his way though colourful crowds of coral reef fish and picking up little treasures found at the bottom of the sea. That day, he and his friend decided to pick some oysters for their lunch. They dived and filled their pockets with some of the biggest shells they could find. They were happy. They couldn’t ask for more on that beautiful sunny day. They sat down on the beach and started opening their oysters. In one of them, my friend found his shimmery treasure. 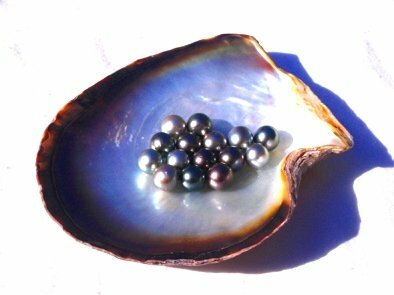 It was neither very big nor very round, he told me, but to him, it was the most beautiful black pearl he had ever seen in his life.